﻿ Knightsbridge Plastics, Inc. - "Molding The Future"
Today, Knightsbridge Plastics, Inc., is recognized as one of the premier industry leaders in the field of precision injection molding and mold making, as well as being exceptionally experienced in a wide spectrum of high performance and exotic plastic materials. We take great pride in the fact that our tool room is the home of six of the nation's most talented and knowledgeable mold makers with over one hundred and seventy years of combined experience producing highly complex tooling in accordance with the exacting demands of our customers. Our compliment of in-house engineers works closely with our client's design and engineering staffs during the developmental phases of their projects in order to insure the optimum results with regard to the design and functionality of their products. The term "Quality on Time" has a special meaning at Knightsbridge Plastics. Throughout our history, it has been the goal of our entire employee roster to remain dedicated to the concept of providing only the highest quality products and service possible to our customers. We are ISO 9001 and ISO 13485 certified in order to provide an even greater array of highly technical injection molded components to our clients involved in extremely specialized market segments. 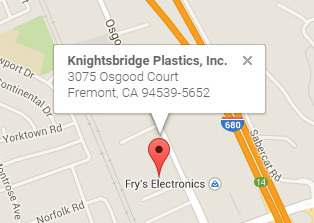 When considering your need to achieve success, and to benefit from superior engineering / technical support, experience, unmatched expertise, quicker response times, professional customer service, quality of product, and positive results are all reasons why Knightsbridge Plastics, Inc. should always be your first choice. © Copyright 2015 Knightsbridge Plastics Inc. All Rights Reserved.